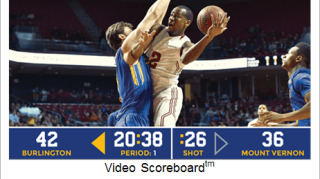 The What: Video Scoreboard (VSB), a division of Dimensional Communications, has announced the availability of its recently updated application-based multi-sport time and scorekeeping solutions. The new applications will reside on all Video Scoreboard systems purchased after November 21st, 2016, including the VSB Basic, VSB Core, and VSB Pro offerings. The What Else: According to Video Scoreboard, the new applications for basketball, volleyball and wrestling provide updated features to enhance game day score and time keeping operations, simplify system setup and usage, all while enhancing security and reliability of the mobility elements of the system. The Bottom Line: Video Scoreboard offers affordable solutions previously only available to professional franchises at great expense, from a simple score and timekeeping appliance that can be easily connected to an existing venue display all the way to multi-source live HD video production with cameras, one button media playback, instant replay and slow-motion.